Merpati and Batavia are bankrupt; TransNusa has cancelled all flights to Sumba. So there are now only 3 airlines that fly to Sumba and vice versa: Garuda flies daily the route Denpasar Tambolaka Kupang. Wings Air = Lion Air flies daily the route Denpasar Tambolaka Ende and Denpasar Waingapu Kupang. Nam = Srivijaya Air flies 3 times a week Denpasar Waingapu Kupang. By now flight schedules are usually respected. Only if there are too few passengers, flights could be cancelled. However due to the amount of stops throughout the day, there will be delays. Only during monsoon and during strong winds, they will not fly. Online bookings direct with these airlines often do not work. So the airlines' websites presented on my link site are for information only. If you don't want to wait too long in Bali, Lombok or Kupang, you must pre-book through a travel agency or via search engines on the internet. Via the website of Ticketindonesia this is sometimes cheaper than via search engines. For Pasola or holidays planes are usually sold out. It is very important to tell the airlines an Indonesian cell phone number for return calls. A foreign mobile phone will not be rung due to high costs. As a precaution you may ask the day before the flight, if everything is on schedule. The airlines do not have offices in Sumba, but are represented by agencies. In Waingapu you get tickets of all airlines in Jalan Ahmad Yani next to hotel Elvin at: BPU Andrew Jonathan, phone 038761363 or 081238065155 and Elimindo, phone 038762776 or 081231015800. In Waikabubak an agency is in the hotel Aloha (at the main crossing), one in the hotel Manandang and the agency Explore Sumba in the Jalan Pattimura at the corner opposite a small mosque Tel. 082146997998. In Waitabula / Tambolaka there are various agencies in the main street. You should take an Ojek to the airport in Waingapu, it is just 3 km. By the way, it has a new name: Umbu Mehang Kunda. From Waikabubak to the airport Tambolaka it is 42 km, which takes more than an hour. From Waitabula / Tambolaka you should also take an Ojek, it is less than 3 km. Pelni Line - runs with the ship KM Awu (made in Papenburg/Germany) every 2 weeks the route: Benoa (Bali) - Bima (Sumbawa) - Waingapu - Ende (Flores) - Sabu (Sabu) – Rote (Rote) - Kupang (Timor) - Larantuka (Flores) - Kalabahi (Alor) - Kupang – Rote - Sabu - Ende - Waingapu - Bima – Benoa. The smaller ship Wilis runs every 2 Weeks the route: Labuan Bajo (Flores) – Waingapu – Ende – Kupang and back the same way. A current schedule is available on Pelni website. Pelni office in Waingapu is in Jalan Hasnnuddin at the old harbour, phone 038761665. Pelni operates from the new harbour. Although the new harbour is located opposite the old harbour, the overland route there is 7 km. ASDP Indonesia Ferry – with the infamous small ferries - has no office in Sumba. They go from Waingapu on Wednesday to Ende (Flores), Thursday to Sabu (Sabu) and Kupang (Timor) as well as Friday to Aimere (Flores) and Kupang (Timor). You get to Waingapu from Kupang on Monday and Thursday, from Savu on Tuesday, from Ende on Wednesday, Aimere on Friday. So the ASDP planned and published it on their website. In times of high waves or any problems these routes will not be operated - and this happens quite often. The almost actual departure times or dates are stuck on the entrance of the ferry terminal in Waingapu. You can contact ASDP in Kupang on 0380890420 and Waingapu on mobile phone 081339415045 or 085346593007. The ferry port of the ASDP is another 2 km behind the new port (where Pelni leaves) - from town this is 9 km. It was planned that once ferries to Savu should start from Baing in the south of Sumba. Due to high waves the construction of the port had been given up. From Waikelo in West Sumba the ASDP ferry goes according to the timetable daily but often only on Tuesday, Thursday and Saturday morning to Sape (Sumbawa). From Sape to Waikelo it goes according to the timetable daily but often only on Monday, Wednesday, and Friday evening. The ferries continue from Sape to and from Labuan Bajo (Flores). This ferry service is more reliable than the connections from Waingapu. Sometimes the ferry in Sumba does not leave from the central port but from the Dermaga Baru east of it. Phone in Sape: 037471075. There is no reasonable tourist map of Sumba. Supposedly accurate maps show roads which definitely do not exist or are in different places - really existing roads are missing. You find a collection of maps on the link site - and, of course, in relevant guidebooks. You can also draw a map from Google Earth and Wikimapia, but beware: dusty roads look very similar to dry rivers and grey asphalt roads can easily be overlooked. That is why I created my own Sumba Map. My Sumba Map or Tourist Map of Sumba is an almost actual roadmap; all tourist attractions of this website and much further details are included. You can get my Tourist Map of Sumba or Peta Wisata Sumba in scale 1:225000 in a high resolution as a printed paper version or as a download version for the smartphone or tablet via the order-button on the feedback page. In the description in this website only the more easily accessible attractions are described. In addition to this map I have created a Garmin GPX file with almost 500 waypoints with indication of direction and a short description. These waypoints are marked on the map with black dots. You can order the list also via the order-button on the feedback page. The second reason is that places are named differently: There is the Indonesian name and its name in the particular local language. Often you find not the name of the place itself, but the name of the district (in Indonesian or local language). If you ask someone in town for a distant place, he will probably say the Indonesian name. In the place itself they only know the name in the local language. The Indonesian word Desa actually means village. But in Indonesia it is an administrative unit, a part of a district (Kecamatan). Because of the low population density in Sumba these "villages" have a great expansion, where the actual village (Kampung) possibly can hardly be found – or does not exist. Rivers often have as many names as areas through which they flow. Family names change when the meaning of the name is also the description of an object (like Mr. Bridge or Mrs. Flower). The remaining roads differ in their quality. Sections are paved and super; sometimes only fragments of asphalt are left, sometimes you go through boulder fields, beaches and river beds. The road layout is adapted to the terrain and on steep sections it usually looks very bad. Many recently constructed roads will only get a gravel bed first. If they do not get paved right away, it is gone again after the next monsoon. In the south of Sumba, there are many fords and a few bridges. In monsoon season bikers might have to wait for a truck to take them over. Because of frequent changes it makes no sense at this point to indicate actual road conditions. Roads, which are logical connections need not be necessarily good, it depends on ethnic connections, whether they are needed. New settlements and transmigration villages are usually completely isolated. The access to traditional villages is usually only possible by motorbike or on foot. It usually says on buses in Sumba where they go to. Buses run generally from the vicinity of the respective markets. Only in Waingapu there are 2 external bus terminals: one in the south and one in the west, each about 5 km outside the town. Meanwhile nearly all busses start at the former "Terminal Kota" at the market, and make an intermediate stop at the outside terminals. Between Waingapu and Waikabubak buses run almost every hour during daytime, it takes about 5 hours. There are also small express buses, which are more expensive, they pick you up at your hotel, do not stop on the way, and are generally faster. From Waingapu to the southeast, to Baing (or Waijelu), there are about 5 buses a day, which takes about 4 hours. To the northwest, to Maru (or Kadahang), there are 3 buses. From Waikabubak to the west, buses leave almost every hour to Waitabula/ Tambolaka. If you want to continue to Pero, to Kodi or Waikelo, you should go to Waitabula and then wait for a connection. To Lamboya district in the southwest, there are 3 buses that go to Kabukarudi or maybe until Gaura. In the southern district, around Wanokaka, there are numerous buses and Bemos. Sometimes there are buses to Mamboro. During daytime Bemos run constantly on all shorter distances in densely populated areas and on paved roads. Just ask where they go or look what is written on them. Bemos are cramped and noisy. Sometimes you have to pay for extra luggage. In all areas where road conditions are bad, you can only find trucks. Usually destinations are painted on in colourful letters. Main routes lead from the markets in town to places at the coast. There is next to no cross-traffic along the coasts. Currently the trip from Waingapu to Tarimbang takes still 4 hours - but the road is gradually repaired. The direct truck does not operate every day. From Waingapu to Tawui the trip takes meanwhile 9 hours in dry season and much longer during monsoon season. At bus terminals, ports, and airports are often unofficial collective taxis available. The price depends on the number of passengers. These collective taxis usually go only to the larger places. For smaller places they do not get enough passengers. For short distances you will almost always take an ojek = motorbike taxi. The backpack is put between the handlebars and the driver, then just sit down behind him and off you go. A helmet is not compulsory out of town. If you do not know the usual price, you have to negotiate beforehand. For long distances on poor roads, the price will be quite high (Bali is not a comparison). You are quite likely to have to help the driver to push the motorcycle. Anyone travelling with a surfboard and rolling suitcase across the country, has no alternative than to rent a car. Car rental is extremely expensive due to road conditions, and because there are only a few suppliers. Depending on the specific road conditions half up to one million rupees a day with driver and gasoline is reasonable. You can rent a motorcycle everywhere. If you rent one from your hotel, the owner of the motorcycle gets only about 2/3 of the rent. To hire a private motorcycle requires some knowledge of language on both sides. The price for a private motorcycle is mainly influenced by the impression which the owner has of you. After all, it's his bike that you might break. Expect about 3 times the price of Bali. A fully automatic motorcycle, as it is often offered in Bali, is not suitable for Sumba. You must be aware that you must often drive up steep gravel roads, through rivers and rough terrain. Honda Revo is the common motorbike in Sumba. Many owners require no deposit - a handshake is all. I consider it is important in the mutual interest, to give the owner, for example an ID card or an ATM card. In addition, you should definitely write down the cell phone number of the owner to give information in case of breakdowns, problems, and to keep up SMS contact during longer trips. For Indonesia, you need an international driver's license - but no one knows that in Sumba - all Indonesian children drive motorcycles when their arms and legs are long enough. At the main road Waingapu, Waikabubak, Waitabula, and Melolo there are now many gas stations. Apart from this route you have to rely on gasoline in bottles. By the length of the queues at the pumps you can get an idea about the gasoline supply. It often happens that a tank ship is late and then there are bottlenecks. "Bensin habis" can be read sometime at the gas stations. The only port for tankers is in Waingapu so the gasoline supply is often not backed up in West Sumba. Sumbanese know that, and are hoarding gasoline. Gasoline is more expensive and rarer to get, the further you are away from a gas station, on Sundays, and when a petrol price increase is pending. 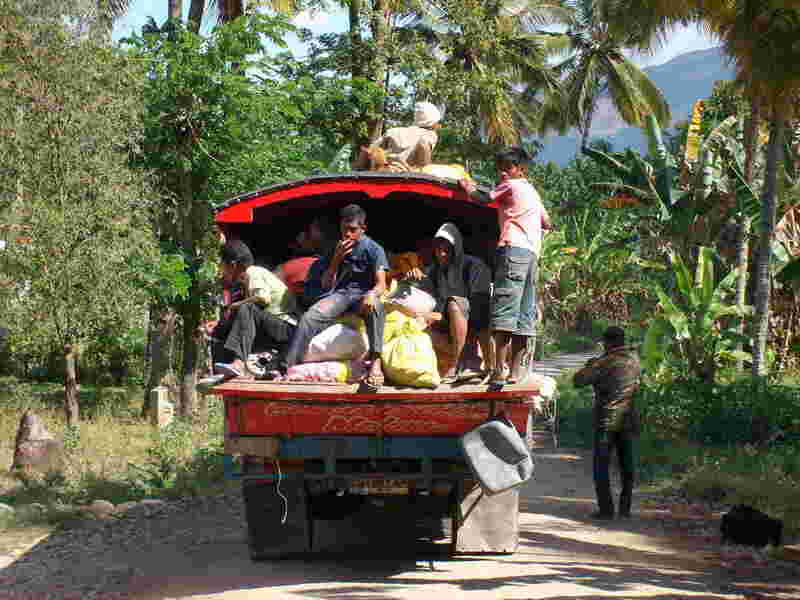 If you drive through uninhabited areas in East Sumba, you must be able to repair tires and chain yourself and carry sufficient fuel and drinking water. Due to many requests from readers I've looked around during my last visits in Sumba whether there are places for riding. Usually people gave a negative reply. Only Philip Renggi, Sony Radjah, and Yuliana Ledatara (cf. below), were interested to this subject. Nothing is offered in Sumba, you just have to ask. There are no special tours or routes, only small narrow paths from village to village and back again, or along the beaches. At following places or beaches riding is possible on request: Kambera, Kalala, Melolo, Tarimbang, Katikuwai, Tawui, Wanokaka, Kerewe, Mamboro and around Waikabubak. Just ask locals. Regular races take place at the Pasola places and at low tide on the beaches such as Melolo, Tawui and Wanokaka. Partly it is training for the Pasola, partly a way to measure their force under the village youth. For the people of Sumba trails and paths are connections between their villages, to water holes, the fields and the next road. As mentioned before there are clear ethnic boundaries between settlement areas. Destinations for trekking are beaches, waterfalls, mountain peaks, and jungle. Therefore it is not easy to find a guide who can really help you. Actually you need several guides: one who translates, one who knows the region as a whole, and one who knows about nature and landscape. Particularly in densely vegetated areas of the south you are dependent on a guide. Many routes are rarely used; they are often overgrown and therefore difficult to recognize. Paths of people (jalan orang) are difficult to distinguish from livestock paths (jalan hewan). Locals also know about boars, snakes, and crocodiles. In the arid north it is easier, but many things can simply be overlooked. The traditional village of Prailiang for example, is so embedded in the landscape that you only notice it because of the noise of children. Trekking in Sumba is possible - but trekking is something locals do not do. A trekking foreigner without a guide is entirely self-responsible. For help in an emergency case you have to take care of yourself. Trekking tours that I have described in this website are mostly demanding. Only some of these tours I have done myself.